Make beautifully decorated cakes that are almost too good to eat with this collection of more than 150 foolproof designs for every occasion, from simple fun motifs for tempting teatime treats to chic and elegant ideas for elaborate celebration cakes. Each entry includes an easy-to-copy template that can be scaled up or down; an at-a-glance recipe of tools and materials; step-by-step instructions; suggestions for mixing and matching with other motifs and a tempting photograph of the finished cake. 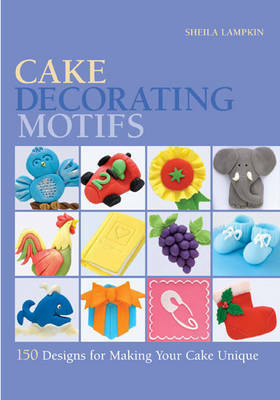 An introductory section demonstrates core techniques, from transferring designs to tips on piping and creating 3D mouldings, and includes easy recipes for some basic cakes as well as a range of delicious icings and sugarpastes. Whether you are baking from scratch or want to give an extra-special touch to a ready-made cake, choose from hundreds of decorative ideas for letters, numbers, borders, animals, birds, flowers, wedding themes, seasonal celebrations and children's motifs.